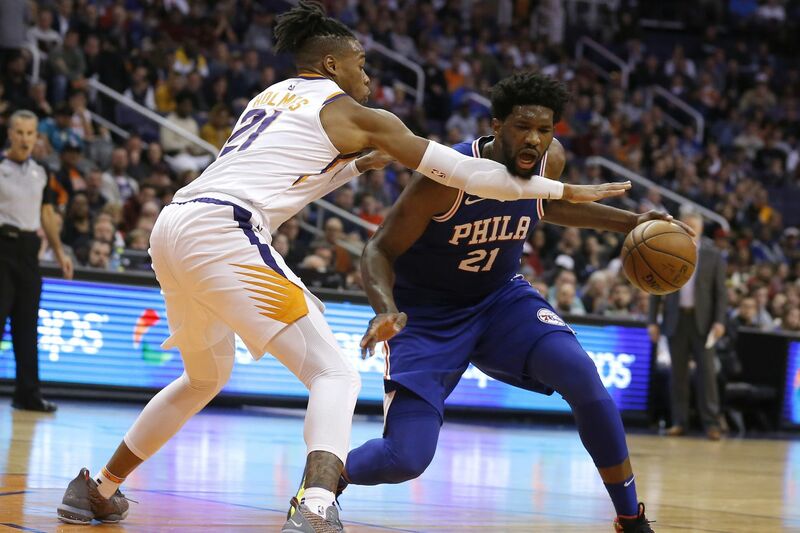 Center Joel Embiid gets fouled by Phoenix forward Richaun Holmes in the second half of the Sixers' 132-127 win against the Suns Wednesday. PHOENIX — This was sort of a confidence-boost game for the 76ers. They headed into Wednesday’s contest against the Phoenix Suns without their starting forwards Jimmy Butler and Wilson Chandler due to respiratory infections. It didn’t matter, thanks in large part to Joel Embiid, whose availability wasn’t determined until right at game time due to soreness in his left knee. Embiid finished with 42 points and 18 rebounds as the Sixers escaped with a 132-127 victory here at Talking Stick Resort Arena. The victory improved their record to 25-14. It also enabled them to go 3-2 on their five-game road trip. And they swept their two-game season series with the Suns (9-30). However, the Sixers nearly blew a 30-point, third-quarter advantage. The Suns pulled within four points (129-125) on Devin Booker’s three-pointer with 13.7 seconds left. Then after a JJ Redick bucket, Booker scored with five seconds left to make it a three-point game. But Redick responded by sinking a pair of foul shots with 4.6 seconds left to give the Sixers a 132-127 advantage. Ben Simmons sealed the victory by blocking a three-point attempt by Mikal Bridges. Embiid was his usual dominant self. The All-Star center secured his 33rd double-double of the season on a tip-in with 7 minutes, 4 seconds remaining in the half. That play gave Embiid 22 points and 10 rebounds. He ended up with 30 points and 14 rebounds at intermission. Embiid became the first player to post at least 30 points and 14 rebounds in a half since Carlos Boozer had 36 and 14 in the second half on March 26, 2007. Simmons and Redick also stood out for the Sixers. Simmons had 29 points to go with six assists. He made 15 of 23 foul shots. His attempts and makes were both season highs. Meanwhile, Redick had 27 points while making 5-of-8 three-pointers. He and Simmons both had 14 points at the half. The trio was expected to lead the Sixers in scoring. However, the unknown was how the team would fare without Butler and Chandler. The Sixers’ bench had been their Achilles’ heel this season. And it was weakened on this night due to Furkan Korkmaz and Jonah Bolden starting in place of Butler and Chandler. That’s why the Sixers weren’t overlooking a Suns squad with the worst record in the Western Conference. The Suns had upset on their minds if Embiid was unable to play. But he played and dominated and the Sixers reserves had solid games. One of the unlikely reserve standouts was two-way player Demetrius Jackson. The point guard finished with eight points on 3-for-3 shooting in a season-high 13:40 of action. His first two baskets came on three-pointers. His third basket came on a two-handed alley-oop dunk that gave the Sixers a commanding 30-point lead (97-67) with 4:08 left in the third quarter. Korkmaz had 10 points, while Bolden had four in his first career start. Booker paced the Suns with 37 points.